Thank you for your participation in the 30th annual Cody Show. Our most important customers are our vendors; without you, none of this is possible. We want you to have a great show. Below you will find dates, locations, schedules and much more information for your reference. If you can't find what you're looking for, just call or email us and we'll be happy to help. 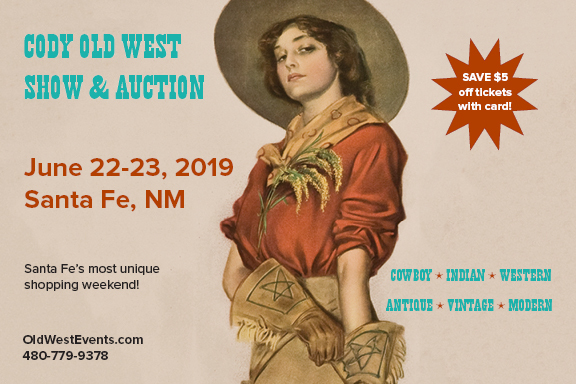 Vendor space for the 2019 Santa Fe show is currently sold out. Contact us if you would like to join the vendor waiting list. In the front lobby of the Santa Fe Community Convention Center (SFCCC). Packet pick-up only, NO drop-off. Packets may also be picked up on Friday morning beginning at 7:30am. Load in at the dock. Packets available beginning at 7:30 am; dock doors open at 8:00 am. Porters on-hand; first come, first served. Porters on-hand; first come, first served. PARKING: Parking garage beneath the Convention Center for a daily fee (usually $10). Pricey parking meters and affordable parking lots in the surrounding areas. When making reservations, please be sure to review all hotel terms and conditions, including parking fees, cancellation policies and other fine print. Call the hotel directly and ask for the "Old West Show & Auction" rate, or onilne Group Code: OWST . The State of New Mexico requires that all exhibitors have a New Mexico Business Tax Identification (CRS) number. No Exhibitor will be permitted to set-up without a CRS number. If you need a CRS application, call NM Tax & Revenue at 505-827-0951 or visit them online HERE. If you already have a New Mexico CRS number, you DO NOT have to apply for a new one. The City of Santa Fe requires all exhibitors have a Special Event License (SEL) to vend items within the City. Download an SEL application HERE. The SEL form MUST be completed and returned to Old West Events by June 1st. If you have an SEL license from another show in Santa Fe in 2019, you do NOT need another for our event, just provide us with a photocopy of your existing 2019 SEL. You must have a New Mexico CRS number in order to apply for an SEL. The SEL must be renewed annually. Right click and save image to your computer for your use! Help us promote the show and tell your clients where you'll be! Right click and save the image at the right for use on all your digital platforms! Don't forget to Watch, Like, Pin and Post us on all of your favorite social media channels. Thank you! We will send those out to the address provided. SHOWCASES: Showcases must be ordered directly from our showcase vendor, Paul Wilson, North American Display Cases. Contact Paul at (720)295-8807 or email: northamericandisplaycases@gmail.com. Download the showcase order form HERE. Use this link www.dynamiceventsdenver.com to see types and sizes of showcases offered. They range in price from $290-$360. BOOTH PAPER COLOR: The following colors for booth paper are available: Black, White, Charcoal, Sand and Leaf. All but white are pictured below. We'll keep adding information and resources as the event gets closer. Check back often!